Paint Store :: Shop by Brand :: Valspar :: VALSPAR 11298 PROFESSIONAL EXTERIOR LATEX PRIMER WHITE SIZE:5 GALLONS. 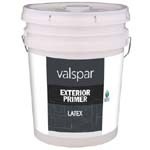 VALSPAR 11298 PROFESSIONAL EXTERIOR LATEX PRIMER WHITE SIZE:5 GALLONS. Valspar Exterior Latex Primer is the ideal primer coat under all oil and latex house paints. It is formulated with 100% acrylic resin for excellent adhesion, long-lasting protection and resistance to peeling and blistering. This primer blocks tannin stains on redwood and cedar and gives a mildew resistant coating. MINWAX 78600 DARK PASTE WAX SIZE:1 LB. 3M 88609NA 9" X 11" 150C GRIT 235U GREEN PRO PAINTER SANDPAPER PACK:15 PCS. VARATHANE 242174H GLOSS CLEAR INTERIOR POLYURETHANE 275 VOC SIZE:QUART. DAP 18260 RELY-ON LATEX CAULK WHITE SIZE:10.1 OZ PACK:12 PCS. KRYLON 1310 SPRAY DULLING SIZE:12 OZ. SPRAY PACK:6 PCS. MODERN MASTERS METALLIC PAINT 92019 ME-591 PLATINUM SIZE:QUART. VALSPAR 21924 SPRAY ANTI RUST ARMOR GLOSS BLACK SIZE:12 OZ.SPRAY PACK:6 PCS. VARATHANE 25008 250081 SPRAY CLEAR GLOSS DIAMOND OUTDOOR WOOD CARE (WATERBORNE) SIZE:SPRAY PACK:6 PCS. IPG RA2 2" X 60 YD TURKEY TAPE BULK PACK:6 PCS. 3M 16024 PPS LIDS & LINERS LARGE PACK:25 PCS.